Rotherham Ladies stunned the northern road running world at Sefton Park by a mature gold medal position, holding off an impressive comeback by Wakefield in the process by some 35 seconds. Jade Allen's initial 13.08 time, fifth-fastest on the day, saw RHAC hold second place for four stages with Natalie Grant, Rebecca Middleton and Anabelle Grady before Natasha Hatswell took that vital step up to first, for anchor runner Steph Burns to cross the line in glory. All the RH girls scored times inside 14 minutes- alone among all the competing clubs. Rotherham B claimed an impressive 22nd place with Robyn Lanceley's 14.10 getting good support from Sharon Marshall, Jayne Allen, Nicola Raynor, Nina Hague and Philippa James. This too would be a qualifying position for the nationals, but unlike the men, ladies have no qualifying requirement. 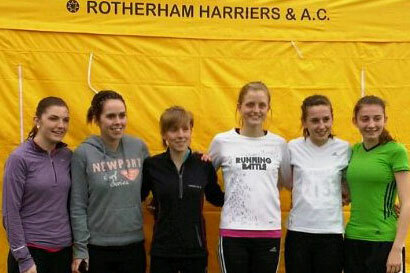 Rotherham Men qualified in 18th place for the national finals in their event won by Liverpool Harriers. Only Leeds (4th) and Hallamshire (8th) finished better from the Yorkshire Clubs. Superb achievements by the RH athletes, coaches, managers and supporters. Well done all of you.